Click to enlarge – 1932 – looking SE along Washington Blvd. towards the back of Keaton’s Kennel (box) on the MGM lot. The “New York” set appearing in The Cameraman (1928) appears to the far right. 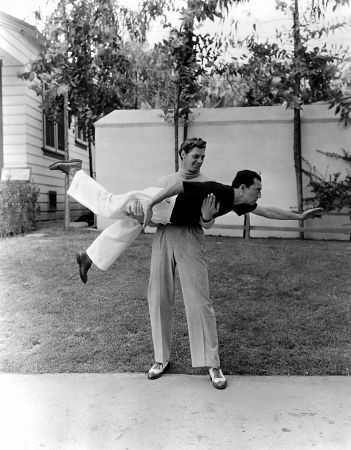 As one of MGM’s biggest stars, Buster Keaton once had a private bungalow dressing room on the studio lot, jokingly dubbed “Keaton’s Kennel.” A reader correctly wrote long ago that the Kennel stood along the north side of the lot, but the precise location remained a mystery. So when noted biographer James Curtis (who’s busy now working on Keaton) asked me to look into the Kennel, I eagerly jumped in. As we’ll see, part of the challenge is that Keaton himself conflated facts and descriptions of the place. To begin, what did the Kennel look like? 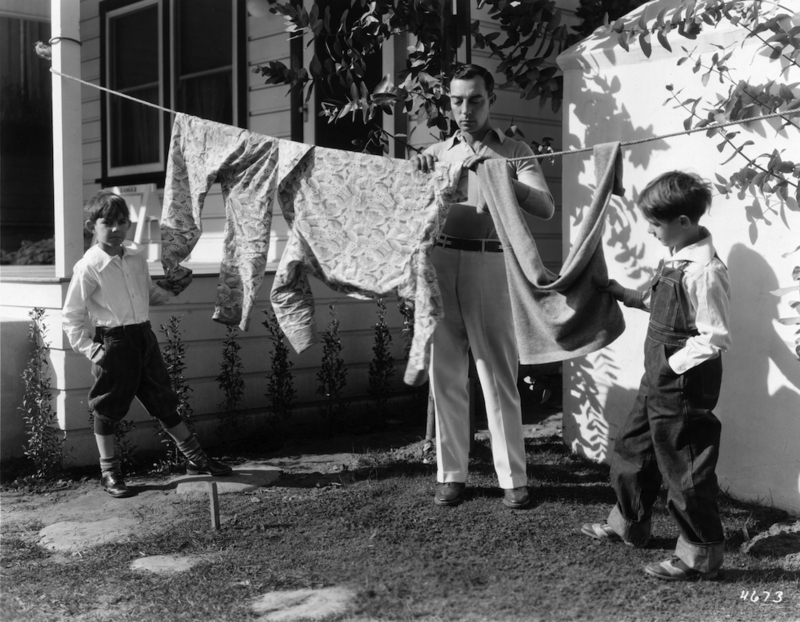 These publicity photos of Buster with his sons Bobby and Jimmy show the Kennel was quite narrow, with only a double window and a single door facing a covered porch, with a sidewalk path to the right, leading to the front steps, and a large building looming very close on the left side. 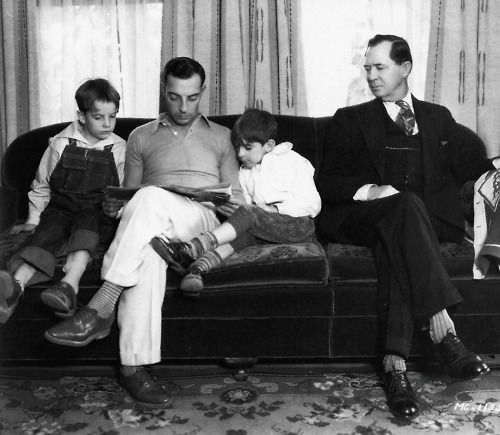 At right, an inside view with grandpa Joe Keaton, taken the same day (notice the matching clothes). View SE showing the 4 too wide bungalows (*) on Grant Ave. Steven Bingen. Keaton writes at page 214 of My Wonderful World of Slapstick that his bungalow was located where the Irving Thalberg Memorial Building now stands, and that it was named the “Kennel” because Keaton’s 170 pound St. Bernard dog Elmer was a fixture sunning himself on the front porch. But as shown in vintage aerial views and the Sanborn fire insurance maps, the bungalows along what was then Grant Ave. (later replaced by the Thalberg Building) were more than twice as wide as the Kennel. So where was the Kennel? At left, it stands in the center of this 1934 aerial view looking north. Notice how it is long and skinny, with a sidewalk path along the right to the front porch. The broad view above shows it stood along Washington Blvd. directly across from the terminus of Motor Ave, immediately to the right of Rehearsal Hall A (A). Further east of the Kennel stood the Short Subject Department (B), originally John Gilbert’s Spanish bungalow, the First Aid Department (C), the Little Red Schoolhouse (D), and more dressing rooms (E), all as reported by Steven Bingen, Stephen X. Sylvester, and Michael Troyan in their wonderful book M-G-M: Hollywood’s Greatest Backlot. 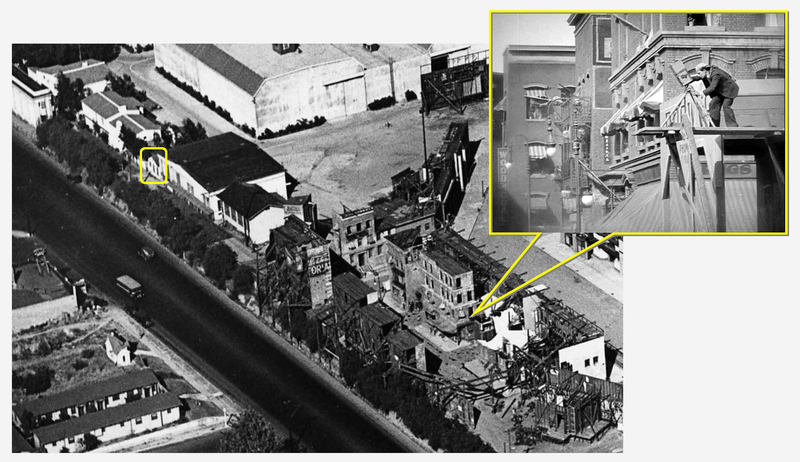 The red arrow above points east along the “New York” backlot appearing in The Cameraman and The Sidewalks of New York (1931). Click to enlarge – view SE – the Kennel (box) in relation to a scene from The Cameraman. 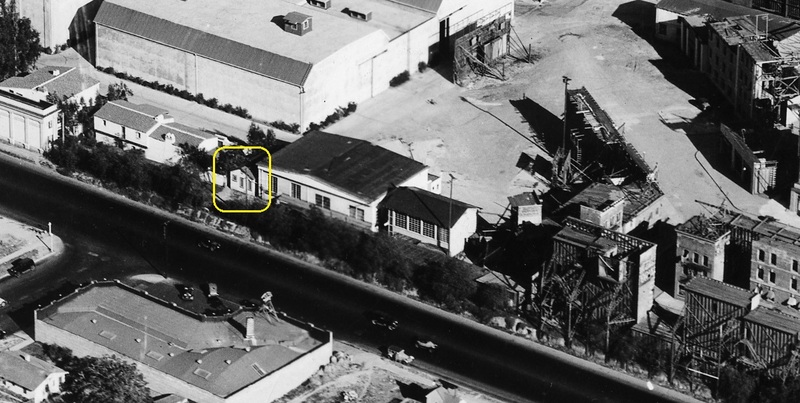 As shown here, the Kennel stood just yards to the east of the “New York” backlot set where Keaton filmed The Cameraman in 1928 (before the Kennel was built), and later scenes for The Sidewalks of New York in 1931 (after the Kennel was built). Given the proximity, I like to imagine Keaton walking from the Kennel to film his 1931 scenes on the “New York” backlot. Above, three views looking east along the “New York” backlot, The Cameraman, upper left, The Sidewalks of New York, lower left, and a matching 1933 aerial view. Keaton was abruptly fired early in 1933, following completion of What No Beer? (Keaton staged the beer barrel avalanche from that film on Court Street – read about it HERE.) 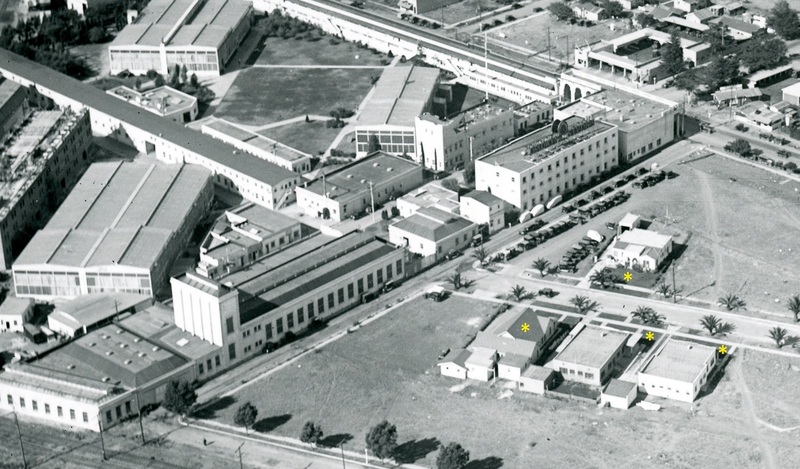 The Kennel remained long enough following Keaton’s departure in 1933 to appear in a 1934 aerial view, but a later aerial view shows it was demolished by 1947. You can read all about Keaton’s prior Grant Ave. bungalow just outside of MGM at THIS POST. Below, the MGM gate today, where Keaton stood (see top of post) during Free and Easy. 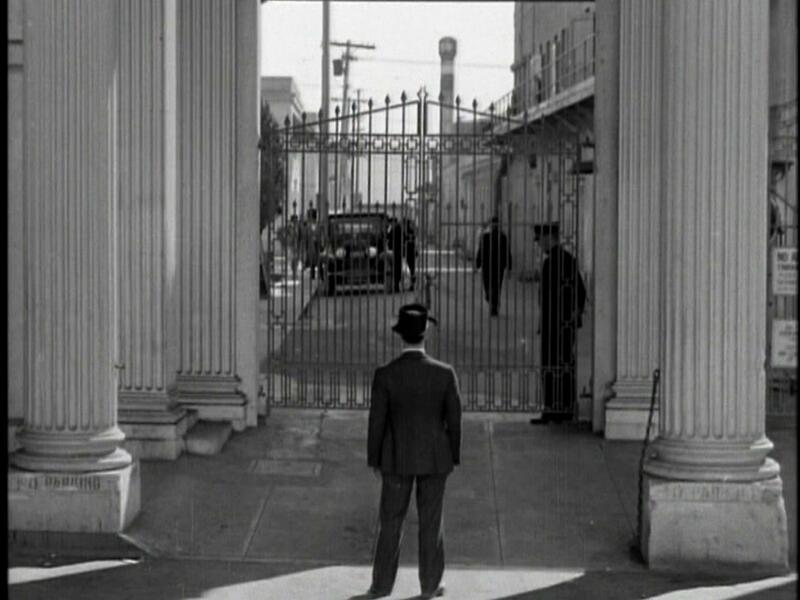 This entry was posted in Buster Keaton, Keaton Studio and tagged Buster Keaton, Culver City, Irving Thalberg Memorial Building, Keaton Locations, Keaton's Kennel, MGM, The Cameraman, The Sidewalks of New York. Bookmark the permalink. Good research on a little known subject. I seem to remember that someone else had a bungalow dressing room out on the Keystone lot, which had a triple purpose. As well as serving as film backdrop, it was also the incubator where the genius of a certain Charlie Chaplin developed. Full marks for your work. Another great read John. Thanks for the efforts.